About "Circles calculate area circumference radius and diameter"
Here we are going to see some example problems to understand how to calculate area and circumference of circle. The radius is a line segment with one end point at the centre and the other end on the circle. It is denoted by ‘r’. Diameter is a chord passing through the centre of the circle. It is denoted by ‘d’. Can we find the distance covered by an athlete if he takes two rounds on a circular track. Since it is a circular track, we cannot use the ruler to find out the distance. The distance around a circle is called the circumference of the circle, which is denoted by ‘C’. 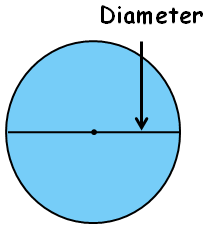 i.e., The perimeter of a circle is known as its circumference. 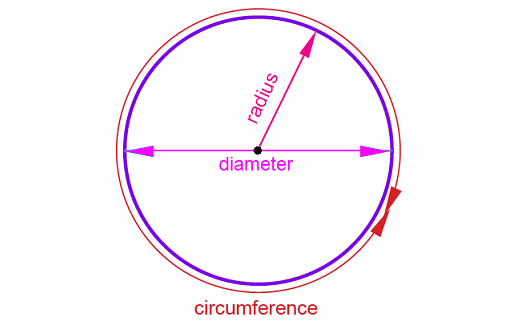 Find out the circumference of a circle whose diameter is 21 cm. Hence the circumference of circle is 66 cm. 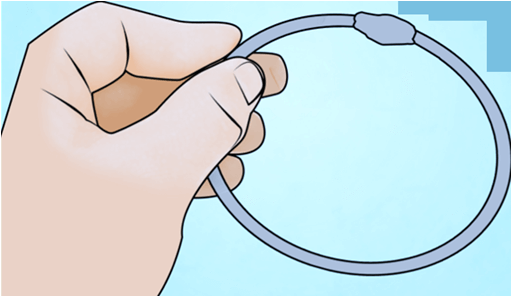 A wire of length 88 cm is bent as a circle. 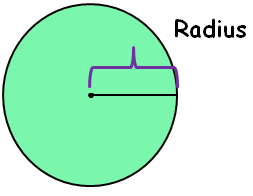 What is the radius of the circle. The diameter of a bicycle wheel is 63 cm. How much distance will it cover in 20 revolutions? A scooter wheel makes 50 revolutions to cover a distance of 8800 cm. Find the radius of the wheel. The radius of a cart wheel is 70 cm. How many revolution does it make in travelling a distance of 132 m.
Given: r = 70 cm, Distance travelled = 132 m.
Hence the number of revolution is 30. After having gone through the stuff given above, we hope that the students would have understood "Circles calculate area circumference radius and diameter".